Chin and cheek injections, augmentation, or implants can be performed in Dr. Sidle’s Chicago office at Northwestern Memorial Hospital. Dr. Sidle, a plastic surgeon who specializes in the face, approaches each patient with overall facial harmony in mind. Enhancing the contours of the chin and cheek will provide a more sculpted appearance with a more balanced profile. Facial implants provide a permanent yet predictable result. One area that can cause significant imbalance to the overall appearance of the face is the chin. A small or short chin can cause the neck to look less defined and create an illusion of having a larger nose. In contrast, a prominent or long chin can make the upper face look sunken and the nose look small. Even small changes in the size of the chin can result in a very noticeable improvement in the overall balance of the face. Chin augmentation is performed through a small incision below the chin with placement of a soft biocompatible implant secured in front of the lower jaw. Some bruising and swelling is to be expected and typically resolves within 1 week. Results can be dramatic with this type of procedure. Likewise, full, high cheeks give a youthful appearance. Cheek augmentation can eliminate the ‘sunken’ appearance under the eyes or a hollowed mid-facial area. 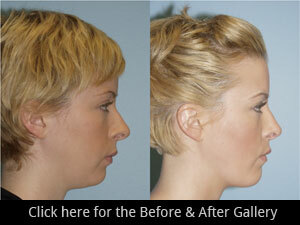 These improvements can be made either with injectable fillers, the patients own fat, or with a permanent implant. Generally, healing is quite rapid and there may be no external scars. Some bruising and swelling is to be expected and typically resolves within 1 week. Dr. Sidle offers a number of procedures to rejuvenate the cheeks including the minimally invasive “72 hour lift”. In this procedure, a suture is used to resuspend the fallen cheeks to a more youthful location. This, in effect, reduces the depth of the nasolabial fold. Downtime is minimal with little swelling or bruising. Most stitches are hidden within the hair of the temples.